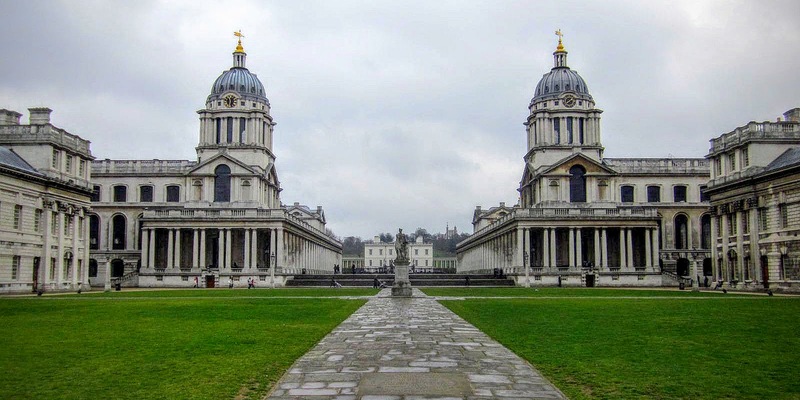 Originally constructed to be the Royal Hospital for Seaman at Greenwich, it was designed by Sir Christopher Wren and was built between 1696 - 1712. It ceased being a hospital in 1869, after 157 years. In 1873 the Royal Navy took over the buildings and used it as a training establishment until they left the site, in 1998, and passed into the hands of the Greenwich Foundation for the Old Royal Naval College. The following year, 1999, some of the buildings were leased to the University of Greenwich, for a term of 150 years. These included parts of the Queen Mary, King William and the whole of the Queen Anne and Dreadnought buildings. The site can often be seen in commercials, TV series and major motion pictures, including: Patriot Games, Shanghai Knights, Lara Croft: Tomb Raider, The Dark Knight Rises, Thor: The Dark World and The Man from U.N.C.L.E. to name but a few. The building is a UNESCO World Heritage Site and are Grade I listed.